How to Make the SharePoint Information Governance Plan for Business? Data is at the center of every business operation in the modern business world. Enterprises need to choose the right platform to store and manage all their data or information to bring in versatility to their operations. Information should be easily accessible to your employees and clients; at the same time there should be effective restrictions on who views it, who manages it and how it is governed. Microsoft SharePoint has emerged as one of the most preferred platforms for information governance. When you hire a SharePoint Development Company you must focus on creating effective information governance plan. 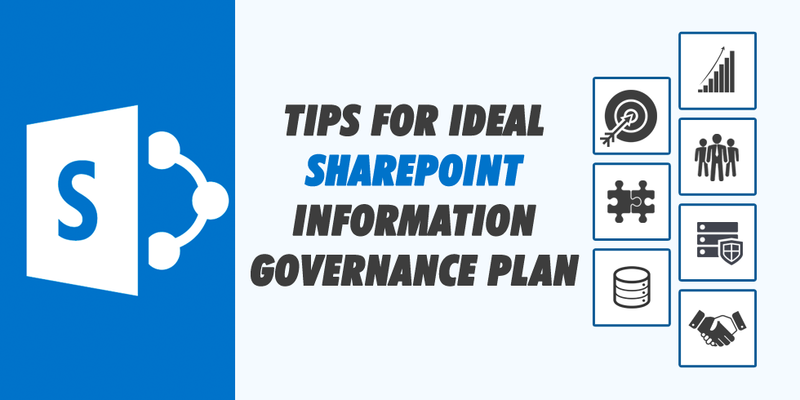 Here we share with you a few tips that would help you build the ideal SharePoint information governance plan for your business. Information governance is not a task which has an end, but is a continuous process. Here the scope would continually grow alongside the growth of your business. SharePoint being a highly scalable medium can accommodate your evolving needs. But at the start you would need to chalk out your goals about data governance. What is it that you plan to get out of your data governance plan? Share these goals with the developers as this helps them address your goals. Involve more people in chalking out these goals as it would help in refining your goals. Chances are that you may have had a rudimentary data governance plan in the past but, it wasn’t able to solve your business problems. While implementing the new plan your focus should be on addressing these issues. If you weren’t able to reach the desired data quality levels or accessibility with the previous solution try and identify the roadblock and make sure they are addresses when your new plan is implemented. Like your business goals, it would also be wise to list your problems and work towards a solution. Data modeling is an important aspect of implementing governance plan for your information. If there are variations and inconsistences with your data modeling your entire governance plan can fail. Rationalizing and standardizing your data modeling is thus one of your priorities when you are working on a governance plan. Whether it is about defining the types and classes of data or their hierarchy your data modeling standardization is often the difference between the success and failure of your plan. Not defining milestones is one of the mistakes that many businesses make with information governance. When milestones aren’t defined you won’t be able to gauge the success of your information governance plan. Your plan would be a function of different policies and you need to define improvement parameters for each of these policies. Quantifiable milestones allow you to study the improvements and also identify the loopholes in your system that need to be corrected. Like all other aspects of your business operations, information governance also needs to be handled by a team. While your IT team may be the preferred choice you also need to involve people from other departments in your organization. Involving end-users into this team brings in varied opinions and issues to the forefront and help in improving your plan. For example, the problems your sales team face with access and use of data in their everyday job may not be known to the IT team. This is one of the most crucial aspects of your information governance plans. A weak data security infrastructure makes you vulnerable to data theft, virus attacks and other kinds of attacks from malicious sources. Thankfully SharePoint has stringent security features that will help you secure your information and prevent unauthorized access. But for such a plan to be successful you may need to train your employees in the best practices of information security. A SharePoint information governance plan may be something completely new to your team. This may require your team members to unlearn some of their old ways of working and pick up this new technology. Often such ideas are met with internal resistance and to overcome such hurdles make sure that your employees are trained in the use of this new technology. You should make them aware of the benefits of this new model of data governance and how it would benefit the organization and at the same time also make their tasks easier. The above tips will help you in creating an effective data governance plan. It is important that you hire a seasoned team for SharePoint customization service. This is where we at Semaphore Software would fit into your business goals perfectly. We have worked with this platform since its inception and have developed custom solutions for clients around the world. If you have any queries or want to discuss your business plan write to us at info@semaphore-software.com.